F-212XLCE, Jumbo Steel String Guitar from Guild in the Standard series. Guild announces the debut of its new Standard Series Acoustic-Electric Cutaway guitars. The Series includes 12 guitars in total – six acoustics and an acoustic-electric cutaway version of each. The Standard Series Cutaway models are all outfitted with an onboard 18-volt D-TAR Wave-Length pickup system. Each Standard Series guitar features a Sitka Spruce top with Red Spruce bracing. The guitars also offer a satin-lacquer finished neck; a slimmer neck profile; bone nut, saddle, and bridge pins; and a dual-action truss rod. The D-40CE and D-50CE are classic Guild Dreadnoughts that feature solid mahogany and solid Indian rosewood back and sides, respectively. With the F-30CE and F-30RCE, the Series offers two Standard Orchestra acoustic-electrics that feature a smaller body size, 1 ¾” bone nut and full scale, making them good for everything from tuned-down finger-style pieces to folk-style strumming. The F-30CE’s mahogany back and sides are designed to produce a strong and focused sound, while the F-30RCE’s rosewood back and sides are designed to produce a rich, complex and warm sound. 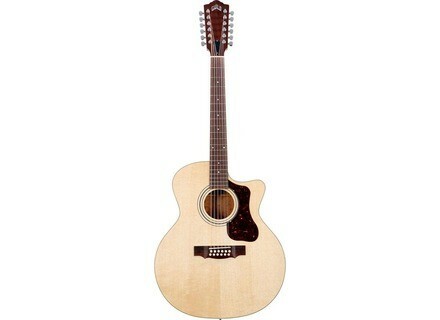 The Standard Series also now includes two Jumbo acoustic-electric cutaways. The F-212XLCE 12-string jumbo cutaway features solid mahogany back and sides for a balanced sound and a wide dynamic range, while the F-50CE boasts a unique arched laminated maple back. [NAMM] RainSong Studio Series RainSong Graphite Guitars is introducing the Studio Series. [NAMM] Epiphone NightHawk Reissue The Epiphone Nighthawk Custom Reissue carries a Grade-AAA flamed maple veneer top finished in a choice of Fireburst, Honeyburst, Trans Amber or Trans Black, complemented by mother-of-pearl "crown" inlays in the ebony fingerboard that echo the classic crown inlay in the traditional Epiphone headstock. [NAMM] Black Cat Mini Trem Black Cat Pedals announces their latest product, the Black Cat Mini Trem.